Is there anything this Hollywood starlet cannot do!? “Twilight’s” leading man is set to perform for the upcoming “Breaking Dawn” soundtrack. Robert Pattinson is not only the highest paid British actor in Hollywood but the star also is a talented musician. Carter Burwell, the composer behind the original soundtrack is working on the score for the final two installments and he tweeted recently about Pattinson’s involvement. Pattinson has sang two songs for “Twilight” films in the past including “Never Think” and” Let Me Sign!”. 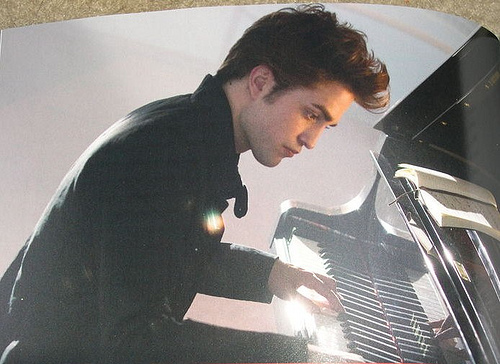 Carter recently wrote in his blog that many actors he works with have to pretend to play instruments, but not when it comes to Edward Cullen.